Lee HealthCare is a trusted companion and the leader in providing personal in-home care solutions and services. We have Registered Nurses available for consultation 24 hours a day, seven days a week. Our goal is to help clients find an in-home solution that fits with their unique set of needs and desires. Lee HealthCare goes one step further by providing coordination of services to manage all aspects of a client's care. 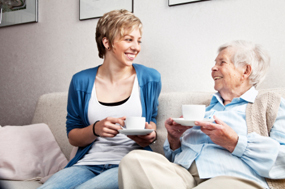 Our services can be a meaningful alternative to facility-based assisted living. Are you seeking employment with Lee HealthCare? Click here.